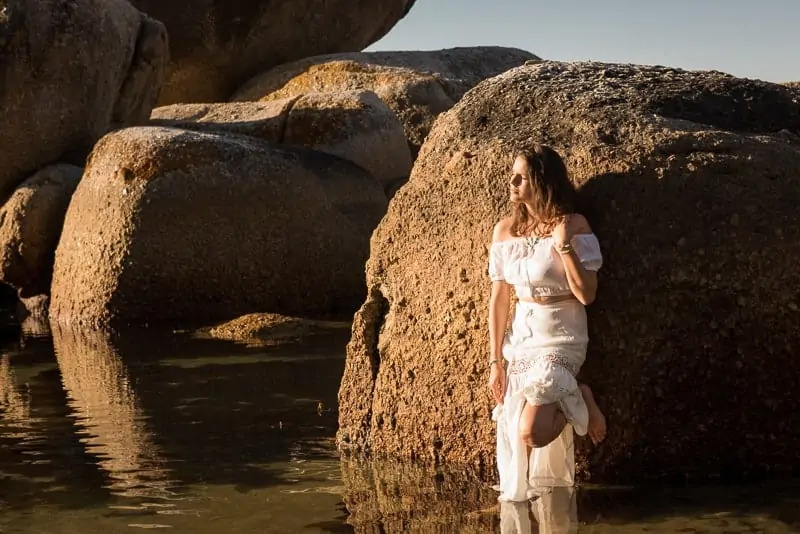 Learning how to control exposure is one of the biggest hurdles for beginners when they first start using a DSLR camera. Annoyingly, it is also one of those things that, once you get it, seems so easy. Everyone starts as a beginner, so keep working towards knowing how to control exposure. It is essential to mastering photography. This is the first in a series of tutorials that will walk you through the fundamentals of how to control exposure settings on your DSLR. Each tutorial will build up your knowledge and before you know it, you’ll be shooting in manual mode. If you’re not familiar with the exposure triangle and how exposure works, it would help to read this article first: The exposure triangle – why is it so important to know? If you’ve only ever used auto, programme, aperture priority or shutter priority you won’t be used to seeing the exposure indicator at the bottom of the frame when you look through your camera. This might be what is holding you back from using manual mode. Never seeing how to read exposure makes the whole idea of setting the exposure yourself very intimidating. So, here you are, I’d like you to meet your exposure indicator. I’ve included Nikon and Canon examples as these are the most popular brands. If you have another brand of camera, it won’t be that much different from these. Now let’s look at how to read this very straight forward little tool. This might be a good time to grab your camera so that you can read and do at the same time. Put your camera into manual mode. If you are in Programme, Aperture Priority or Shutter Priority the exposure indicator won’t show, because you don’t need the meter to tell you if the exposure is okay. UNLESS, you’ve set your exposure compensation. Then it will indicate either over or under, depending on what you’ve set. Let’s not get into that just yet. 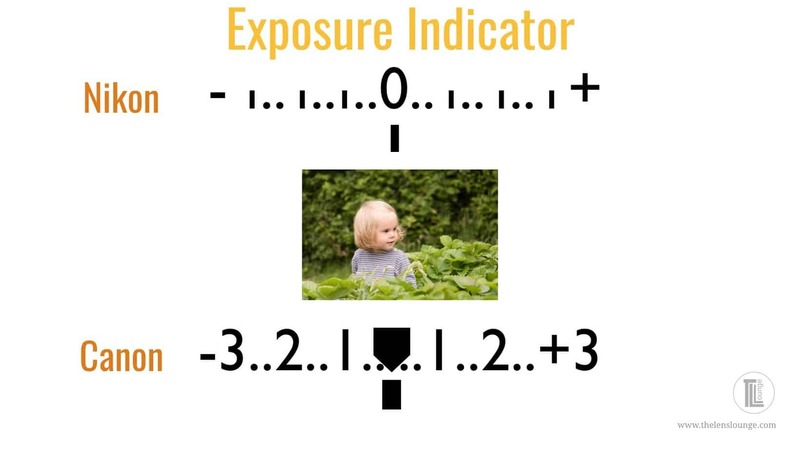 Let’s first understand how to read the exposure indicator to take an accurately exposed image. Look through the viewfinder of your camera. It doesn’t matter what you aim at, just don’t aim into the light as that’s not ideal for your eyes. Also, you need to have taken the lens cap off – I know I’m stating the obvious here. Part depress the shutter so that the camera focuses and meters whatever you’re pointing at. Can you see the exposure indicator at the bottom of the frame? You might have the plus sign on the left or it might be on the right. I have mine set to the right, because it just makes sense to me that minus is on the left and plus is on the right. If you want to change it, you can do so using your camera menu. Look for “reverse indicator”. So back to what we were doing. You’re in manual shooting mode, pointing your camera at anything that takes your fancy, but looking at your exposure indicator in your viewfinder. 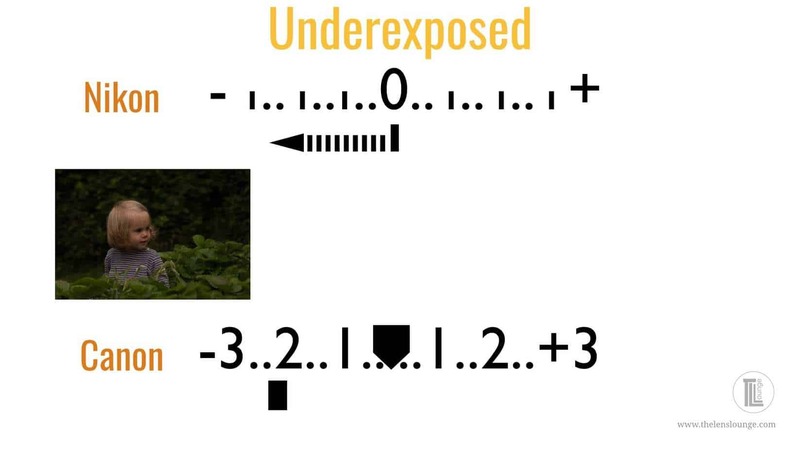 If you have markings underneath the exposure indicator like this, you’re overexposed. If the markings on the exposure indicator are going the other way, like this, you’re underexposed. This is where you want the markings to be. Perfectly exposed in the middle. So, how do you make that happen? Let’s start with the overexposed example. Change either your shutter speed to a faster speed or your aperture setting to a higher f-stop (deeper depth of field). You might need to change it quite a bit, depending on what your camera is set to in comparison to how much light is around you. It might even be so completely off the scale that you can’t initially see it, but you will. Keep going until your exposure indicator lines up in the middle like this. You either reduced the amount of time the shutter is open by setting a faster shutter speed. Or you decreased the size of the hole the light passes through by setting a higher f-stop. You therefore reduced the amount of light reaching the sensor to a point where it was just right. Now for the underexposed reading. While looking through the viewfinder, change either your shutter speed to a slower speed, or your aperture setting to a lower f-stop (shallower depth of field). Again, you might need to change it quite a bit, depending on your settings, but keep turning until the indicator lines up. In this instance you could have increased the amount of time the shutter is allowed to be open by setting a slower shutter speed. Or you increased the size of the hole the light passes through by setting a lower f-stop. You therefore increased the amount of light that reaching the sensor. If you understand this, you will be ahead of the game. It is so beautifully simple, but at first it can be confusing. If you keep at it, I promise you that one day it will be simple. Sometimes we need to meter the exposure of the entire scene, sometimes a tiny part of the scene. This is why we have different metering modes. The exposure metering system on your DSLR camera can be fooled, such as when shooting in snow. We look at what types of situation will confuse your camera and what you can do about it. 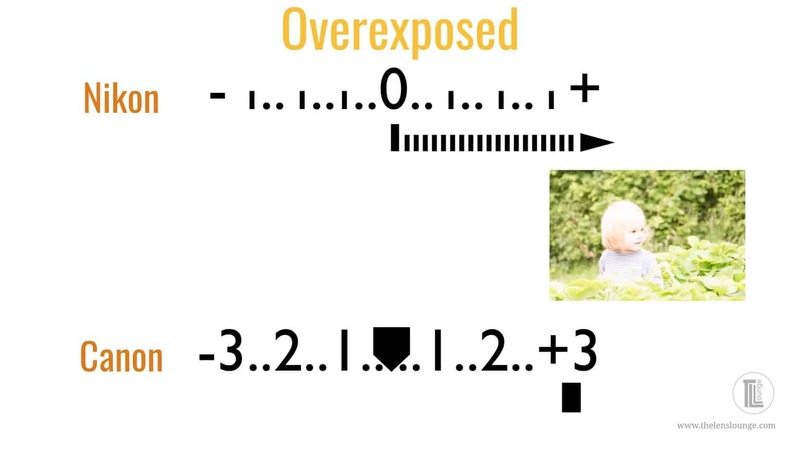 For this you’ll need to know about exposure compensation. Maybe you want a faster shutter speed or shallower depth of field? The camera doesn’t know how to achieve creative results, it only knows how to give an accurate average exposure reading for the area that is being metered. We look at when and how to use program mode, aperture priority, shutter priority and manual mode for creative results and controlled exposure. Sometimes there is so much going on that you need a little auto help. We look at the benefits and limitations of using auto ISO – even in manual mode! If you don’t want to miss when new photography tutorials are published, pop us your email address. You’ll receive our aperture cheatsheet instantly and every Monday we’ll also send you our Through The Lens bulletin of helpful tips and tutorials. Enter your email to grab your FREE aperture cheat sheet and weekly tips. Success! You'll be hearing from us. You might need to check your spam folder and "unspam" us. If you have any questions about how to control exposure on your DSLR camera, let us know in the comments. 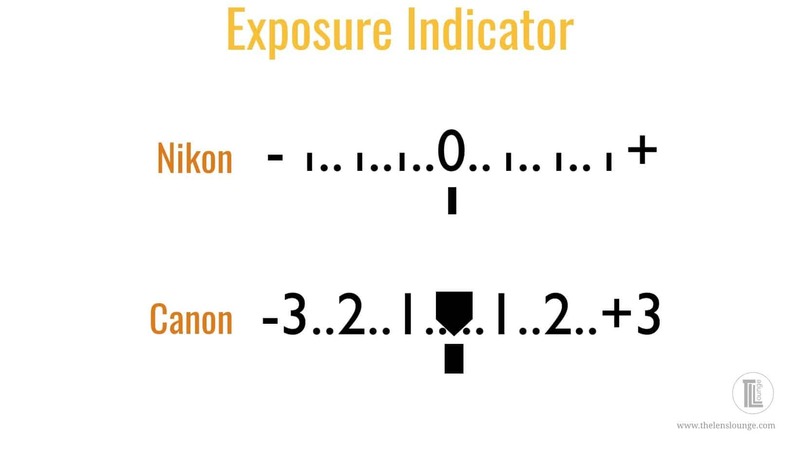 Also, we love good news, so if our tips on using your camera’s exposure indicator have helped you to understand how to control exposure, share that too. When, why and how to use exposure bracketing? Does the left to right rule really matter in photography composition? The Exposure Triangle – why is it so important to know? Has this photography tutorial helped you to understand how to control exposure? Share the learning… pin it, post it, tweet it. Copyright © 2019 The Lens Lounge. All rights reserved.